And not just because they commissioned and published an illustration from this blogger, but I won’t lie, it does go a long way. Would I have so passionately recommended Portable Restroom Operator magazine (a real publication…I Googled it) if they’d bought an illustration? Not likely. Okay maybe. But seriously, Flow is the real deal. If you’re not familiar, Flow is a Dutch publication directed mainly toward women seeking to “simplify their lives, feel connected and live mindfully.” Hey, aren’t we all? And the great thing is that Flow is available in honest-to-god 3D, meat world, glorious paper (as well as in pixels on iTunes). You can order all formats from their website. English versions are available. So call me androgynous, call me a metrosexual..I am completely sans uterus and I loved this magazine anyway. Clever knows no gender. Great for scrapbooking, posters, menus, and signs. 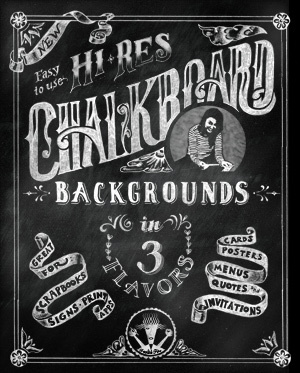 Use with our tutorial on How to Fake a Chalkboard Effect in Photoshop. A set of 3 high-res backgrounds in black, green and blue is only $1.99. NEW! Get the original high-res .PSD file and customize your own backgrounds.